Release of the Smart Production Cell Yamaha "YSC1" | Yamaha Motor Co., Ltd.
Yamaha Motor Co., Ltd. announces the March 2011 release of the new Smart Production Cell, Yamaha "YSC1." This versatile new assembly machine is an accumulation of proven Yamaha Motor know-how from the design and manufacture of industrial robots and SMT (surface mount technology) equipment*1in the fields of image recognition technology, high-precision positioning and correction technology and easily adaptable robot programming technology. YSC1 is composed of handling tools including optical imaging cameras, multipurpose heads and conveyors as its base mechanisms. To this, user-specific applications are added to create an assembly cell capable of automating a wide range of assembly processes or improving existing manufacturing processes. 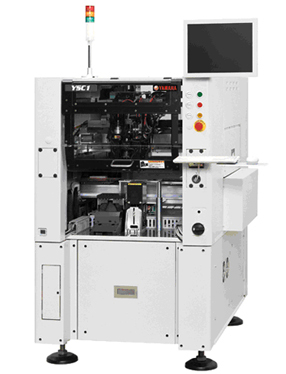 By using a number of YSC1 machines in sequence in the production line, with each set up and programmed to perform the smallest (individual) work processes, it is possible to automate the assembly of such products as power modules, camera lens modules for mobile devices or compact sound (acoustic) devices. YSC1 can also be used to supplement production lines with functions that could not be handled by conventional SMT equipment, such as mounting high-load large-capacity connectors, attaching flexible circuit board carriers and sorting tray components, etc. YSC1 is fitted with SMT functions including 2-dimensional code reading and traceability function*2 that make it possible to accommodate high-function IT systems. *2 Traceability: Functions that record and manage the history of when and how a product was manufactured. An information management function necessary for tracing products in cases of product recalls, etc. Smart Production Cell, Yamaha "YSC1"
Name Smart production cell, Yamaha "YSC1"
Recent years have seen the rapid emergence of new environment-conscious products like hybrid and electric automobiles and energy-saving home electronics LED light fixtures and the new product categories emerging with advances in IT such as flat TVs, smart phones and tablet mobile devices, etc. Many of these products include manufacturing processes that cannot be performed by conventional compact, high-density SMT production machines and standardized production methods. This has made it difficult to automate certain production processes for these new products. Until recently, specialized automated devices were created with combinations multipurpose robots and image processing systems to perform these processes. However, achieving the necessary assembly precision and handling precision has proved difficult technically and keeping pace with the needs for frequent changes in work contents and processes due to the shortening life cycle of today's products have remained problems in the development of specialized machines of this type. The new Smart Production Cell Yamaha YSC1 is a compact, multipurpose assembly machine designed to handle work processes that until now have not been automated and processes that have been difficult to handle with conventional equipment. The base machine is composed of image recognition technology, high-precision positioning and correction technology and robot programming technology accumulated from Yamaha Motor's long experience in the design and manufacturing of industrial robots and surface mouters. To this, compatible applications are added to make it function as a production module for automating or improving work processes for a wide variety of assembly jobs for manufacturers. Unlike conventional specialized automation machines designed to perform several processes in one machine, YSC1 is a compact assembly machine that can be used as modules in sequence to perform the smallest (individual) work processes in assembly lines, thus making it easier to reuse the individual machines for different processes. The multipurpose I/O (input/output) interface provided with this model makes it possible to add a variety of actuators and sensors and other units to the machine to ensure easy, flexible adaptation for versatile use in switching between a wide range of production processes and methods. Enabling user to set the smallest unit controls (individual axis action commands, individual I/O commands, conditional branching) greatly reduces the time required for developing new production processes or programming/set-up for new product manufacturing.